Social media networking has catapulted to the #1 activity on the Web and has changed forever the way in which we interact. Approximately 75% of all adult Americans use at least one of the hundreds of established social media platforms. While it can be overwhelming, social media is an essential component to a business marketing plan. Your marketing program doesn’t have to include all social media outlets, but there is a significant importance to having some kind of presence in the online social scene. 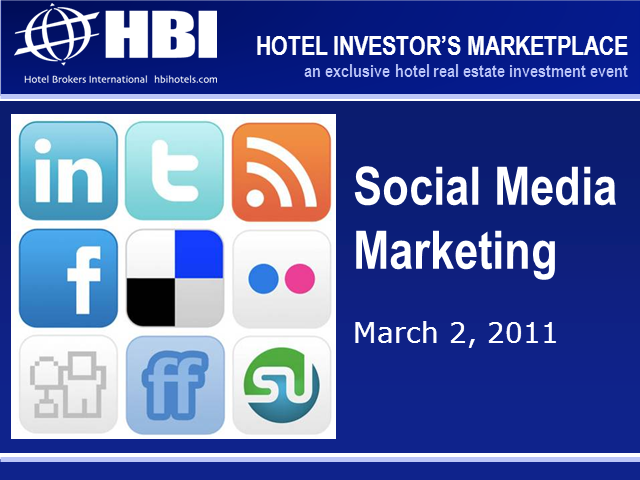 Join the Hotel Investor’s Marketplace Webcast on March 2 as we welcome Brian Bagel, social media director for TIG Global, who will talk about the overall importance of using social media in hotel marketing and share what tactical steps hotel owners/managers can take to improve their hotel’s online marketing. TIG Global provides hotel Internet marketing management services to more than 800 hotels, resorts, restaurants and spas - from small, independent boutique properties to large international brands, located in more than 20 different countries around the world.